As the last full week of this project concluded, 39 artists and arts administrators had joined me in my studio. (One or two August dates are being scheduled for those who were away or had conflicts.) Many thanks go to all participants, to Asha Veal Brisebois for admin support and Jared Larson for videography. Next is editing. I’ve learned much, and look forward to reviewing the material in depth. Videos will be posted on Vimeo. For now, here’s a summary of the week. As visual artists, Aimée, Lisa, Mary and Pat work in very different contexts. 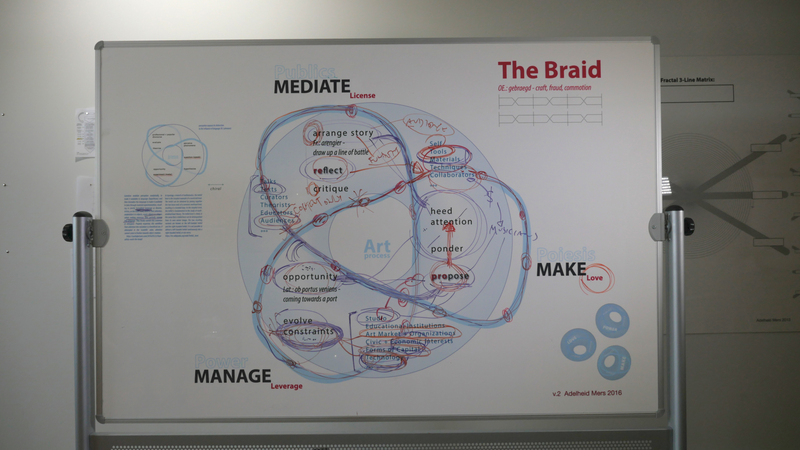 In debating The Braid, a ‘pretzel’ was selected that isolated the areas of Mediating and Making against Managing. This theme echoed through much of the week. A musician and arts administrator, Matt’s Braid was the one that made seamless use of the trefoil that wraps the donut, presenting all aspects of making, mediating and managing as fully integrated. As the Associate Director of the Youth Network Art & Science Academy at Breakthrough, Amy used the Whiteboards to show how the STEAM pedagogy she pursues ties critique processes into both art and science education. Serving as a staff retreat, salient points of the discussion were the rewriting of process diagrams of creativity as scenarios of evolving identities, explicit placement of student art making on an art world map while framing it in the context of art research, and the need to foster awareness of how learning is situated in relation to schools as institutions. In discussing their projects, including Seen and Heard and Stockyard Institute, Jim and Rachel considered in depth how organizations and temporary project platforms function to capture imagination and support in pursuit of pedagogic relationships that build trust, over a long time. Barbara used The Braid to sketch out a career overview, as she is transitioning into new projects. It was quite amazing to see how her art work, service to Chicago’s artists at DCA/DCASE, and new plans to create a Reuse organization are all rooted in the same, selfless attention to the presence of resources, seeking aesthetic and effective ways to make them available for common good. A painter and installation artist, Ann discussed both project and ongoing studio work in relation to The Braid’s areas. This gave rise to the notion that project work is tied closely into the Management loop, while studio work seeks to focus on interactions between Mediating and Making. We also pondered uses of the Critique Template in teaching. This discussion between a designer and a painter netted two moves that stood out for me: the designer’s insistence on an extended phase of non-intentional making as part of not only exploratory but also client focused projects, and the painter’s location of inspiration, often through tacit, physical experience in the realm of opportunity.